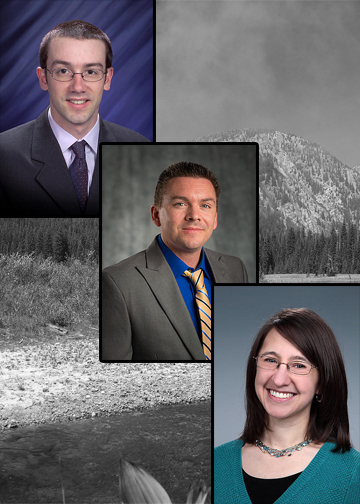 Sebastien Kerisit, Shawn Riechers, and Frances Smith are part of the team that will lead geochemistry symposiums at American Chemical Society Spring 2017 Meeting. Benjamin Legg, Jennifer Soltis, and Michele Conroy, not pictured. Geochemistry -- the science of the reactions in the atmosphere, the oceans, the soil and deep underground -- affects everything from recovering oil to producing food. Six talented researchers from Pacific Northwest National Laboratory organized events focused on advances in geochemistry. These events, organized by Sebastien Kerisit, Benjamin Legg, Shawn Riechers, Jennifer Soltis, Michele Conroy, and Frances Smith, will take the stage at the American Chemical Society's (ACS) spring meeting in San Francisco. As chair of the 2017 Geochemistry Division Medal Committee, Kerisit co-organized two events to honor the medal recipient: Susan Brantley, a professor from Penn State. Brantley is a driving force in rock weathering, a series of intricate processes that shape our world. Kerisit along with Anastasia Ilgen from Sandia National Labs organized the medal symposium, with a list of invited speakers discussing the latest research. Kerisit and Alexis Navarre-Sitchler from the Colorado School of Mines organized another symposium in honor of Brantley. At PNNL, Kerisit researches a wide range of topics relevant to the geochemistry community including the chemistry of mineral-water interfaces, carbon capture and sequestration, the aqueous corrosion of glasses, the mechanisms of mineral nucleation and growth, and the redox properties of natural systems. Kerisit has organized and chaired eight symposia at ACS national meetings over the last 5 years. Legg and Riechers organized a symposium on mineral nucleation. The event brings together experts to discuss experimental and computational contributions that present novel structures, dynamics, or mechanisms of nucleation and phase transition in complex systems. Several PNNL scientists will speak at the event, including Christopher Mundy, Shawn Kathmann, Michel Sassi, and Gregory Schenter. At PNNL, Legg uses atomic force microscopy, statistical mechanics, and thermodynamics to answer difficult questions about mineral nucleation, nanoparticle aggregation, and nanoparticle-environment interactions. Riechers studies mineral nucleation in situ at the nanoscale, which provides a detailed understanding of simple surfaces and allows him to extrapolate results to more complex surfaces. Soltis, Conroy, and Smith along with R. Lee Penn from the University of Minnesota organized a symposium on nanoparticle reactivity, which is vital for areas including nuclear materials processing. Understanding the evolution of nanoparticle reactivity with changing conditions is a fundamental step in developing a detailed picture of the role of nanoparticles in environmental and industrial settings. At PNNL, Soltis uses both cryogenic and in situ fluid cell microscopy to elucidate the mechanism of nucleation and growth of nanoparticles of geochemical or radiochemical interest. Conroy studies the different life stages of metal nanoparticles from nucleation through dissolution. Smith conducts materials and geochemistry research, including the long-term storage of nuclear materials. The 2017 Geochemistry Division Medal Symposium starts at 1 pm on Monday, April 3. Kerisit's second event begins Tuesday morning at 8:30 am. The event organized by Soltis, Conroy, Smith, and Penn begins Wednesday at 8:30 am. The symposium by Legg and Riechers begins Thursday at 8 am. Posters for these events will be presented on Monday and Wednesday evening.